In 1983, the new bishop of Scranton was consulted on the appointment of a new archbishop of New York. John O'Connor was familiar with the See given his long service as a Navy chaplain, culminating with his four years as auxiliary bishop to the Military Vicar, Cardinal Terence Cooke. 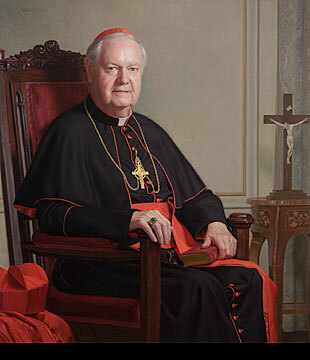 O'Connor later made it known that, while the new archbishop would inevitably face some difficulties, he opined that none would be due to the New York presbyterate, who served well, loved the church and were loyal to their archbishop. Less than seven months after his installation in Scranton, Bishop O'Connor was promoted to the Big Apple. He may only be gone six years, but how times change. Long-simmering tensions among a broad cross-section of the archdiocese's priests broke into the open today with the circulation of an anonymous letter under the authorship of a group calling itself "A Committee of Concerned Clergy for the Archdiocese of New York." Saying that, "At no time has the relationship between the Ordinary and the priests of the Archdiocese been so fractured and seemingly hopeless as it is now," the authors have urged their confreres to lodge "a formal vote of 'NO Confidence'" (emphases original) in Cardinal Edward M. Egan, who became archbishop in 2000. Using strong language throughout the 950-word missive, the authors allege a widespread finding that Egan's relationship with his priests has been "defined by dishonesty, deception, disinterest and disregard." The cardinal turns 75 on 2 April, when he must submit his letter of resignation to Pope Benedict XVI. In its entirety, the letter and accompanying ballot are published below for the first time outside of the New York presbyterate. As he recovers from a September knee-replacement, the cardinal's intense displeasure at the move has already become known. Joseph Zwilling, director of communications for the archdiocese, declined comment on the document. A Committee of Concerned Clergy for the Archdiocese of New York has met to discuss the critical condition of the Archdiocese of New York. As you would understand, because of the severely vindictive nature of Cardinal Egan,this committee must remain anonymous. This letter is being sent to many priests throughout the Archdiocese so that at each Vicariate meeting a formal vote of “NO Confidence” can be exercised with regard to Cardinal Edward Egan in his role as Archbishop of New York. As you know, the collective memory of the presbyterate cannot recall a time in recent history when the morale of priests has been so broken and low. Some of our elderly priests can well recall the Cardinal Spellman years. Many remember the tenure of Cardinal Cooke and certainly everyone remembers Cardinal O’Connor. At no time has the relationship between the Ordinary and the priests of the Archdiocese been so fractured and seemingly hopeless as it is now. Since his arrival in New York, the Cardinal has given his time, attention and interest to matters financial while paying little or no attention to the spiritual needs and concerns of the priests and faithful of the Archdiocese. During the last six years the Priests of the Archdiocese of New York have been patient, understanding, tolerant and loyal. Several attempts have been made to open avenues of communication with the Cardinal but to avail. During the last six years, the Cardinal’s relations with the Priests of New York have been defined by dishonesty, deception, disinterest and disregard. Far too many of our brothers can speak personally of the arrogant and cavalier manner in which they have been treated by the Cardinal. Early in his tenure, the cruel and ruthless way in which several priests who served on the seminary faculty were dismissed, was an adumbration of how many other priests would also be treated. Time and again, the Cardinal fails to be the Father that every bishop must be to his priests. With regard to important policies and decisions that impact upon the welfare of the Archdiocese, it is evident that the Cardinal does not seek advice or counsel from the many competent and experienced priests who so faithfully serve as pastors and members of his chancery staff. Instead, it is regrettably and seemingly apparent that the Cardinal relies on the advice of his priest-secretary [Msgr Gregory Mustaciuolo] who enjoys a most limited and meager pastoral experience. The Fifth Anniversary of September 11th was a sad reminder of the Cardinal’s decision to leave New York only two days after the attack, during a time when the city desperately needed a spiritual leader. How sad, painful and disappointing it was to hear the tabloids referring to the then Mayor Giuliani as the “Shepherd of the City”. Since that time, the Cardinal has continued to fail in his role as Shepherd. Pope John Paul II referred to New York as the Capital of the World. How unfortunate it is that the voice of the Archbishop of New York is almost never heard in that “Capital”. The Cardinal demonstrates an unnatural fear of the media and he forfeits the great opportunity to employ the media as a means of addressing the many contemporary questions of faith and morals. It is unthinkable that in this millennium a Successor to the Apostles would shrink from such a valuable opportunity for evangelization and hide himself within the walls of his residence. Sadly, it is evident that this Cardinal is unable to deal with the complexities, problems and challenges of an Archdiocese of the magnitude and diversity of New York. For these reasons and more, the Priests of the Archdiocese of New York must express a vote of NO CONFIDENCE. Such a vote would encourage the Papal Nuncio and the Holy Father to strongly consider accepting the Cardinal’s resignation in April,2007, when he reaches the age of retirement, rather than at a future and uncertain date before his 80th birthday, as can often be the case with retiring Cardinals. The search for a new Archbishop should begin sooner rather than later. Rome must know that the priests and people of New York desperately need a Bishop who will be “strong, loving and wise” (II Timothy: 1:7): a Bishop who will love his priests, seeing them as his spiritual sons and faithful assistants: a Bishop who will begin the healing that is so desperately needed in this Archdiocese: a Bishop who will preach and teach without fear of seeing his name in a newspaper: a Bishop who will truly see holiness in Truth. The Committee suggests that at each vicariate meeting a secret ballot be taken in which each priest who is present could vote. It was thought that only priests and no deacons should participate in this vote. The votes should be counted at that meeting and the tally registered on the enclosed form. The form should be signed by two witnesses and a copy sent to each of the Vicars General. It would be incumbent upon the Vicars General to report the vote to the Papal Nuncio. At this important and critical moment, let us move forward with prayerful courage. These vote was taken and counted in the presence of all those in attendance at the Vicariate meeting.